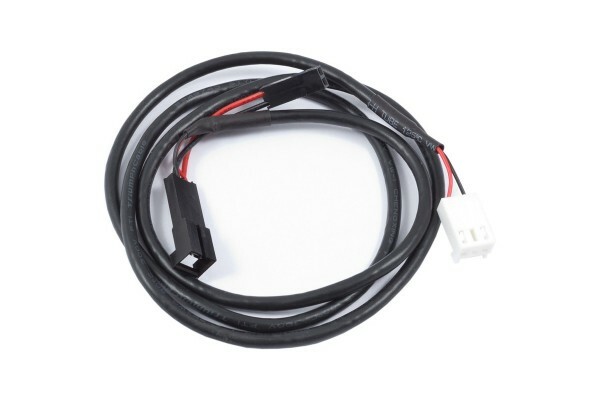 This cable can be used to connect the alarm header of an aquastream ULTIMATE, poweradjust 3 or mps family device with the power switch header of a computer motherboard. This allows for an emergency shutdown of the PC in case of an alarm condition. The cable is to be connected in between motherboard and PC case power switch, the power switch remains operational. Total cable length approx. 70 cm. Before connecting the cable, make sure the RPM/alarm header of the device is configured correctly! Tab "Alarm configuration": "Power switch (53217)" has to be activated. Tab "Alarms": "Power switch (53217)" has to be activated. After connecting the cable, test the setup by deliberately creating an alarm condition. If the PC is not shut down, the cable header connected to the motherboard must be rotated by 180 degrees and the test has to be repeated. Emergency shutdown may result in data loss as operating system and running programs are not shut down properly!